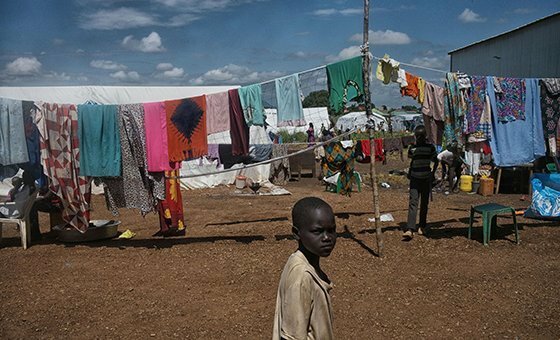 Nearly 3,500 people displaced by violence in South Sudan have been relocated from a UN-run camp in the capital, Juba, to temporary housing, the organization’s mission in the country, UNMISS, on 4 September 2018 reported. UNMISS\Nektarios Markogiannis | Thousands of people living in a UN protectioncamp in Juba, South Sudan, have been relocated to new temporary housing, Mangateen Camp. “Hundreds of thousands of people fled to UN protection sites across South Sudan out of fear for their lives during the ongoing conflict. But these camps are not a good long-term option for families,” Shearer stated. “If people have the trust and confidence that the environment is safe enough for them to voluntarily return home, UNMISS is poised to assist them. But providing that confidence in the security situation very much lies with the Government.” (SOURCE: UN).